The subtitle of Eric Kandel’s Reductionism in Art and Brain Science is “Bridging the Two Cultures”. Which cultures? Why bridge them? Kandel’s two cultures are science and humanities: the physical nature of the universe, and the nature of human experience. His claim is that neither culture understands the other’s methodologies or goals. I can accept this claim, though I have no deep experience with either culture. The real reason Kandel chose to write a book about art and brain science is that he knows a lot about brain science, a lot about art, and likes to talk about them. The intellectual justification is that the modern versions of art and brain science are reductionist in nature. This commonality suggests that the gap between cultures is narrower than it may first appear. De Kooning applies certain artificial restrictions in this work, permitting other dimensions to run free. It is a kind of experiment. Another reason for the joint study of art and brain science is that their forms of reductionism are related in a fascinating way: the brain subsystems that we use to form our perceptions of reality are highly activated when appreciating certain kinds of abstract art. Kandel pays special attention to the investigative, experimental work of the New York School. 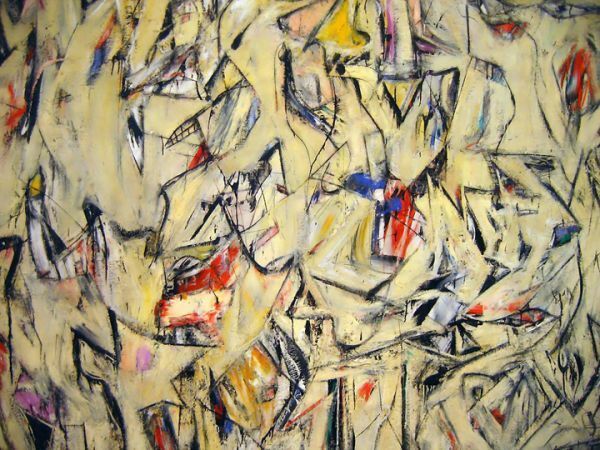 When we understand more about how our brain perceives, Kandel says, we can better appreciate what is captivating and unique about abstract art. This kind of investigation need not be a joy kill, as physicist Richard Feynman explains here. Just as perception is incomplete without top-down information, so is art. Art is incomplete without the perceptual and emotional involvement of the viewer (sayeth Riegl). Gombrich calls this the “beholder’s share“: the viewer’s interpretation of what is seen in personal terms. The beholder’s share is what supplies meaning to the picture. It reflects our consciousness and humanity. One of Kandel’s key points is that abstract art relies more heavily on top-down processes than figurative art. Stripping away easily pattern-matched representational images puts more weight on our top-down systems, leaning on our beholder’s share: our imaginations, emotions, and creativity. First, the societal and technological change that catalyzed the evolution of Western painting. Oversimplifying: Western painting evolved to depict an increasingly realistic representation of the world (sometimes with help, as chronicled by Hockney and in Tim’s Vermeer) until the advent of photography. Photography can represent reality more accurately than painting, “thus a dialogue emerged through the two art forms”. Painting needed to go elsewhere. A search for an alternative niche began, one of which was greater abstraction. This leads to a discussion of the abstraction of the figurative image by Turner, Mondrian, and others. and finally the conclusion: that a deeper understanding of brain science will inform and enhance art. It’s fascinating stuff, filled with well-chosen examples. Kandel provides an entertaining and thoughtful read. In so doing, Kandel takes another step down a path reaching back to the ancient worlds on all continents and through the golden ages of many of the world’s great cultures. Consciousness and the Brain, written by French neuroscientist Stanislas Dehaene, is a fascinating overview of the mechanisms, boundaries, and possibilities of consciousness, from the point of view of an applied researcher. The work of great Dutch primatologist Frans de Waal led me to Dehaene; time permitting I will summarize some of de Waal’s insights in future posts. The primary claim of Consciousness and the Brain is that genuine consciousness is indicated by conscious access: the ability for attended information to enter awareness and become reportable to others. It is the capacity to bring to mind accessible perceptions and thoughts. Vigilance, the state of wakefulness, and attention, the focusing of mental resources onto specific information, are not sufficient to constitute consciousness in Dehaene’s view. the enablement of autonomy (augmenting the spontaneous activity that also occurs in the brain). Experiments can teach us much about consciousness and the theory of the global workspace. Dehaene focuses on experiments with “minimal contrast”: “a pair of experimental situations that are minimally different but only one of which is consciously perceived”. Riding the line in this way helps determine the mechanisms that govern conscious perception. Unconscious mechanisms play a massive role in our lives and being. While much of our mental activity, and much of what drives our lives, are unconscious mechanisms, virtually all of the brain’s regions can participate in both conscious and unconscious thought. Unconscious mechanisms can be of a higher order than we may assume; for example conscious attention is not required to bind the elements of a scene together. The unconscious binding together of systems occurs in vision, language, attention, and even certain mathematics. (Notably, several of these examples match areas of recent progress in machine learning using neural networks.) These unconscious operations can be detected and measured through careful experiment. the ability to share our thoughts and perceptions through the use of language. The ignition of our parietal and prefrontal circuits. A late slow wave in our brains, referred to as a “P3 wave”. A late and sudden burst of high-frequency oscillations. The synchronization of information exchanges across distant brain regions. These signatures are detectable through various means including FMRI (Functional Magnetic Resonance Imaging), MEG (magnetoencephalography) and EEG (electroencephalography). Because consciousness appears to emerge from the building, looping, and coordination of signals from different brain subsystems (see above), consciousness lags the real world. Consciousness is formed from loops in the brain. It is these loops that permit construction of mental images given incomplete sensory data; for example there are massive differences between our the raw, imperfect visual data that enters our eyes (e.g. the blind spot in our eyes directly behind our optic nerve, or our limited color range perception outside the center of our attention) and our conscious perception. The ability to read the traces of conscious thought allow us to theorize about consciousness. Global neuronal workspace theory claims that the human brain has developed efficient long-distance networks to select relevant information and disseminate it throughout the brain. Consciousness is an evolved device that allows to attend to a piece of information and keep it active. Conscious information can then be routed to other areas based on goals. Within our brain there are collections of neurons that send reinforcing signals to each other under certain conditions, for example when a particular person, event, or sensation is perceived or remembered. During conscious perception, a small subset of workspace neurons become active, while most others are inhibited. The panoply of signaling related to inhibited clusters, for example, all clusters that do not pertain to the 2016 Chicago Cubs, form a recognizable signal which is referred to as the P3 wave. In other words, a primary signifier of conscious thought is the signal resulting from the repression of neurons. The P3 wave is in a sense a “negative thought signal”. Not all unconscious thought is the same. Several types can be defined. Preconscious thought is information already encoded by an active assembly. It can become conscious at anytime. Subliminal thought is input given or processed so weakly that we lack the capability of attending to it. Disconnected patterns are mental activities which have no relation to conscious thought, for example our regular breathing. Diluted mental activity is neural information that has been “downsampled” for use by other systems in the brain, and therefore cannot be brought to consciousness. For example a visual pattern that flickers so fast that you cannot see it. Early levels in our visual system may register this flickering but it is transformed by later levels. Detecting and theorizing about consciousness allows us to ask, and potentially answer, deep questions. For example, a series of recent experiments seems to indicate the presence of consciousness within severely injured patients who cannot express their consciousness. An example is the case of Jean-Dominique Bauby, the author and subject of The Diving Bell and the Butterfly. A patient without the ability to communicate or move can be asked to imagine, for example, riding a bicycle for 30 seconds. The patient’s brain can be scanned via MRI during this period, and compared to a control group to establish that the neuronal clusters responding to bike riding, along with the signatures of consciousness, are present. It is then worth asking what is uniquely human about human consciousness. Dehaene provides informed speculation. Perhaps it is our ability to combine our core brain systems using a “language of thought”: the inner voice that is nearly always present inside of us. Perhaps also it is our capacity to compose our thoughts using nested or recursive structures of symbols. This implies that language evolved as an internal representational device, not just as a communication system with other hairless apes. The ability to compose and nest may underlie many of our unique human abilities, such as the ability to craft complex tools, perform higher mathematics, and our self-consciousness. An examination of brain areas that are particularly well-developed among humans (as opposed to other primates) seems to support these theories at a high level. Dehaene closes by theorizing what it would take to build artificial consciousness using computers. This topic, while fascinating, is not a primary subject of Dehaene’s book, and is best saved for another time. I highly recommend Other Minds, by Peter Godfrey-Smith. It’s a fascinating exploration of the minds of cephalopods, who independently from vertebrates developed sophisticated nervous systems and what any reasonable person would call intelligence. In so doing, Godfrey-Smith explores the tree of life, the origins and components of complex thought and consciousness, and the ways of formless, curious creatures deep below. Read this book! Godfrey-Smith describes two important revolutionary periods in Earth’s evolutionary history. In each case, a means of communication between organisms became a means of communication within them. The first is the Sense-Signaling revolution. Roughly 700 million years ago, the first organisms that we could reasonably call animals – sensing and acting organisms – evolved. Just a bit later, around 542 million years ago according to Godfrey-Smith, certain organisms began to develop not only sensing mechanisms, but signaling mechanisms too. Both sensing and signaling, directed outward, provide evolutionary benefits: they help animals navigate and influence their environments. There is another advantage: these same sensing and signaling mechanisms can be used inside the space of the organism to better coordinate its sense-action loop. Input is processed through the senses, and then signaled in a targeted fashion to another part of the organism (be it tentacle, flipper, paw, or hand) to generate a specific response. Sensing and signaling happens inside only higher order organisms like animals. The internalization of sensing and signaling marks the beginnings of the development of the nervous system. Millions of years later, the sensing and signaling mechanisms found in animals are often incredibly complex. The second is Language. Less than half a million years ago, human language emerged from simpler forms of communication. Language is nothing but an elaborate, auditory form of sensing and signaling. Its more rudimentary forms are used by our primate cousins to warn, coax, plead, and threaten. In humans, these signals became more universal in expressive power, and more nuanced (despite recent examples to the contrary). Godfrey-Smith, building on Hume, Vygotsky and others, notes that speech is not only for our others, but for ourselves. Each of us has an inner dialogue that runs through our heads from wake to sleep, and even in our dreams. Our inner speech is inseparable from our conscious selves. In a beautiful passage, Godfrey-Smith writes, “inner speech is a way your brain creates a loop, intertwining the construction of thoughts and the reception of them.” This loop not only helps us direct our action, but it can clarify, integrate, and reinforce our conceptions. For Godfrey-Smith and others such as Baars and Dehaene (whom I’ll cover in a future post since Consciousness and the Brain is amazing), our inner speech is a necessary ingredient in our integrated subjective experience as human beings. It helps us to direct our thoughts in a deliberate, planful way – the “System 2 thinking” that Kahneman writes about in Thinking Fast and Slow. The Sense-Signaling and Language revolutions were both forerunners of radical planetary change. In the first case, the Cambrian explosion, in the second the rise to primacy of homo sapiens. “The Cognitive Revolution (c. 70,000 BCE, when Sapiens evolved imagination). The Agricultural Revolution (c. 10,000 BCE, the development of farming). The unification of humankind (the gradual consolidation of human political organisations towards one global empire). Harari’s Cognitive Revolution, in my view, maps reasonably well to Godfrey-Smith’s Language revolution. The remaining items in Harari’s list, when considered in Godfrey-Smith’s context, seem like nearly inevitable consequences of the first. Perhaps I am giving us too little credit, or perhaps too much.